WASHINGTON (AP) — A pot belly can be a bad thing — even if you’re not considered overweight. New research suggests normal-weight people who carry their fat at their waistlines may be at higher risk of death over the years than overweight or obese people whose fat is more concentrated on the hips and thighs. Monday’s study signals the distribution of fat matters whatever the scale says. “If the waist is larger than your hips, you’re at increased risk for disease,” said Dr. Samuel Klein, an obesity specialist at Washington University School of Medicine at St. Louis, who wasn’t involved in the new research. It also has implications for advising patients whose body mass index or BMI, the standard measure for weight and height, puts them in the normal range despite a belly bulge. Abdominal fat — an apple-shaped figure — has long been considered more worrisome than fat that settles on the hips and below, the so-called pear shape. 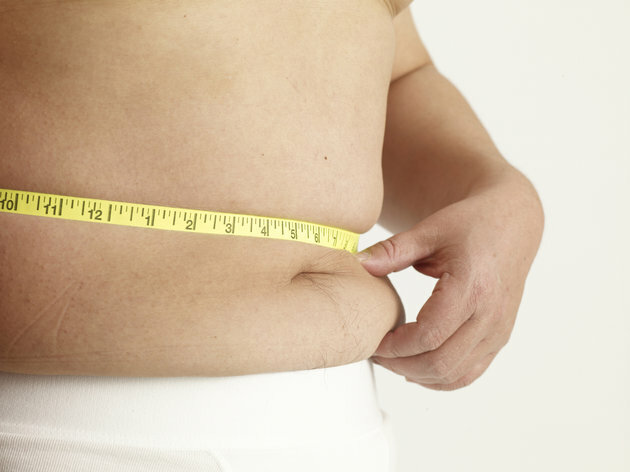 Risk increases for men if their waist circumference is larger than 40 inches, and 35 inches for women. Still, doctors typically focus more on BMI than waistlines; after all, girth tends to increase as weight does. But a BMI in the normal range may not give the full story for people who are thin but not fit, with more body fat than muscle, or who change shape as they get older and lose muscle, Lopez-Jimenez said. His study analyzed what’s called waist-to-hip ratio, dividing the waist circumference by the hip measurement. There are different cutoffs, but a ratio greater than 1 means a bigger middle. Researchers checked a government survey that tracked about 15,000 men and women with different BMIs — normal weight, overweight and obese. More than 3,200 died over 14 years. At every BMI level, people with thicker middles had a higher risk of death than those with trimmer waists, the researchers reported in Annals of Internal Medicine. In the study, 11 percent of men and 3 percent of women were normal weight but had an elevated waist-to-hip ratio. Surprisingly, they were at greater risk — for men, roughly twice the risk — than more pear-shaped overweight or obese people. Fat that builds around the abdominal organs is particularly linked to diabetes, heart disease and other metabolic abnormalities than fat that lies under the skin, said obesity expert Dr. Lisa Neff of Northwestern University, who wasn’t involved the study. Blood tests typically show higher blood sugar and triglyceride levels in people with a belly bulge, so doctors might spot their risk without a tape measure, Klein noted. Genetics plays a role in apple shapes and waistlines tend to increase with age, so Neff and Klein advised even normal-weight people to pay attention if belts are getting tighter. Sorry, sit-ups aren’t the solution, they said: Like all weight loss, it requires a healthier diet and general physical activity to burn calories.